Affinity purified against GST-LC3B [DU 40082]. MEF cells were treated with the mTOR inhibitor AZD8055 to induce autophagy. Bafilomycin A1 was used to inhibit autophagic flux. Antibody detects LC3-II but not LC3-I in samples. Purified GST-LC3 and HIS-LC3 are also shown. 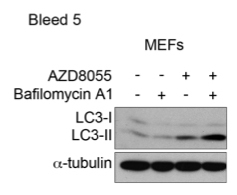 MEF cells were treated with the mTOR inhibitor AZD8055 to induce autophagy. Bafilomycin A1 was used to inhibit autophagic flux. 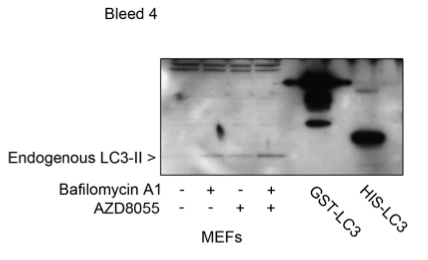 Antibody detects both LC3-I and LC3-II. 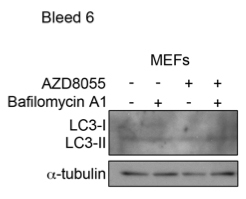 MEF cells were treated with the mTOR inhibitor AZD8055 to induce autophagy. Bafilomycin A1 was used to inhibit autophagic flux. Antibody detects both LC3-I and LC3-II. High background level with bleed.